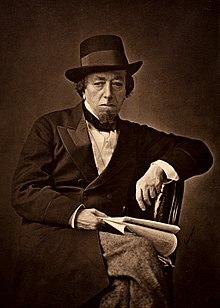 One-nation conservatism was first conceived by the Conservative British Prime Minister Benjamin Disraeli, who presented his political philosophy in two novels, Sybil, Or The Two Nations and Coningsby, published in 1845 and 1844 respectively. Disraeli's conservatism proposed a paternalistic society with the social classes intact, but with the working class receiving support from the Establishment. He emphasised the importance of social obligation rather than the individualism that pervaded his society. Disraeli warned that Britain would become divided into two nations (of the rich and poor) as a result of increased industrialisation and inequality. Concerned at this division, he supported measures to improve the lives of the people to provide social support and protect the working classes. Disraeli justified his ideas by his belief in an organic society in which the different classes have natural obligations to one another. He saw society as naturally hierarchical and emphasised the obligation of those at the top to those below. This was based in the feudal concept of noblesse oblige, which asserted that the aristocracy had an obligation to be generous and honourable and to Disraeli this implied that government should be paternalistic. Unlike the New Right, one-nation conservatism takes a pragmatic and non-ideological approach to politics and accepts the need for flexible policies as one-nation conservatives have often sought compromise with their ideological opponents for the sake of social stability. Disraeli justified his views pragmatically by arguing that should the ruling class become indifferent to the suffering of the people, society would become unstable and social revolution would become a possibility. In Europe, Catholic political movements emerged in the 19th century as a response to widespread deterioration of social conditions and rising anti-clerical and democratic tendencies amongst artisans and workers. It mixed social commitment, paternalistic social welfare and authoritarian patronage from above with deepening popular piety. In France, the influence of these doctrines can be seen in the conservative socialism of Albert de Mun and René de La Tour du Pin. The German conservative Lutheran figure Adolf Stoecker founded the Christian Social Workers' Party in 1878 that aimed to align workers with Protestant Christianity and the German monarchy. Stoecker respected existing social hierarchies, but he also desired a state that would be active in protecting the poor and vulnerable citizens. Stoecker on occasion used antisemitic rhetoric to gain support, though he urged supporters to practice Christian love even towards Jews. 19th-century German Chancellor Otto von Bismarck adopted policies of state-organized compulsory insurance for workers against sickness, accident, incapacity and old age in what has been nicknamed "Bismarckian socialism", better known as "State Socialism". The term was actually coined by Bismarck's liberal opposition, but later accepted by Bismarck. Bismarck himself was not a socialist and enacted the Anti-Socialist Laws, rather his actions were designed to offset the growth of the Social Democratic Party of Germany. Bismarck's policies have been viewed as a form of state socialism. However, Bismark's State Socialism was based upon Romantic political thought in which the state was supreme and carried out Bismarck's agenda of supporting "the protest of collectivism against individualism" and of "nationality against cosmopolitanism" and stated that "the duty of the State is to maintain and promote the interests, the well-being of the nation as such". The academic equivalent of Bismarck's State Socialism at the time was the Kathedersozialismus of Adolph Wagner and Gustav Schmoller. Schmoller was an opponent of both liberalism and Marxian proletarian socialism. Wagner had originally been a Manchester liberal, but he had developed into a far-right conservative and antisemite. Kathedersozialists held in common three tenets, namely that "economic freedom cannot be absolute", "the economy must obey ethical as well as practical demands" and "the state must intervene to provide a degree of social justice". Schmoller denied that free trade and laissez-faire economics were suitable for Germany, instead advocating state intervention in the economy to foster industrialism and improving conditions for labourers. Schmoller endorsed the Prussian monarchy as historically being a "benevolent and socially mediating institution". Schmoller stated: "A firm monarchy is a great blessing when it is bound up with traditions like those of the Prussian monarchy, which recognizes its duties". A red Tory is an adherent of a political philosophy derived from the Tory tradition, predominantly in Canada, but also in the United Kingdom. This philosophy tends to favour communitarian social policies while maintaining a degree of fiscal discipline and a respect of social and political order. In Canada, red Toryism is found in provincial and federal Conservative political parties. The history of red Toryism marks differences in the development of the political cultures of Canada and the United States. Canadian conservatism and American conservatism have been different from each other in fundamental ways, including their stances on social issues and the role of government in society. The adjective "red" refers to the economically left-leaning nature of red Toryism in comparison with blue Toryism since socialist and other leftist parties have traditionally used the colour red. Although in Canada today red is commonly associated with the centre-left Liberal Party, the term reflects the broad ideological range traditionally found within conservatism in Canada. The term right-wing socialism is a term used by some free-market right-libertarian movements and politicians to describe paternalistic conservatism as they see it supporting paternalism and social solidarity as opposed to individualism, commercialism and laissez-faire economics. They argue that paternalist conservatism supports state promoted social hierarchy and allows certain people and groups to hold higher status in such a hierarchy, which is conservative. The term is also used—more commonly, but distinctly—to refer to moderate social democratic forms of socialism when contrasted with Marxism–Leninism and other more radical left-wing alternatives. In The Communist Manifesto, Karl Marx and Friedrich Engels criticised the Philosophy of Poverty by the anarchist writer and theorist Pierre-Joseph Proudhon as representing conservative or bourgeois socialism. Military socialism, guild socialism, agrarian socialism and some forms of Christian socialism are also termed right-wing socialism by various authors. The term conservative socialism was used as a rebuke by Marx for certain strains of socialism, but it has also been used by proponents of such a system. An early proponent of self-described conservative socialism was 19th-century Austrian politician Klemens von Metternich as early as 1847. Monarchists had begun to use socialist as an antithesis of "bourgeois laissez-faire" indicating reliance on a social conscience as opposed to pure individualism. Metternich said the aims of such a conservative socialism were "peaceful, class-harmonizing, cosmopolitan, traditional". Monarchic socialism promoted social paternalism portraying the monarch as having a fatherly duty to protect his people from the effects of free economic forces. Metternich's conservative socialism saw liberalism and nationalism as forms of middle-class dictatorship over the masses. Johann Karl Rodbertus, a monarchist conservative landowner and lawyer who briefly served as minister of education in Prussia in 1848, promoted a form of state socialism led by an enlightened monarchy supporting state regulation of the economy. Rodbertus supported the elimination of private ownership of land, with the state in control of national capital rather than redistribution of private capital. In the 1880s, Rodbertus' conservative socialism was promoted as a non-revolutionary alternative to social democracy and a means to justify the acceptance of Bismarck's social policies. ^ a b c Dorey 1995, pp. 16-17. ^ a b c Heywood 2007, pp. 82–83. ^ Dana Arnold (2004). Cultural Identities and the Aesthetics of Britishness. Manchester University Press. p. 96. ^ a b Dorey 1995, pp. 16–17. ^ Bloor 2010, pp. 41–42. ^ Eley (1997), p. 174. ^ Eley (1997), pp. 174–175. ^ Gottfried Dietze. In Defense of Property. Lanham, Maryland, US; London, England, UK: University Press of America, 1995, p. 97. ^ a b Albert S. Lindemann. Esau's Tears: Modern Anti-Semitism and the Rise of the Jews. First paperback edition. Cambridge, England, UK; New York, New York, US; Melbourne, Victoria, Australia; Madrid, Spain: Cambridge University Press, 2000, p. 145. ^ a b Alan John Percivale Taylor. The Course of German History: A Survey of the Development of German History. London, England, UK; New York, New York, U.S.: Routledge, 1988, 2001, p. 149. ^ a b c d e f Harris (1989), p. 442. ^ a b c Marcel Stoetzler. The State, the Nation, & the Jews: Liberalism and the Antisemitism Dispute in Bismarck's Germany. University of Nebraska, 2008, p. 241. ^ "Conservatism". The Canadian Encyclopedia. ^ Rothbard, Murray N. Left, Right, and the Prospects for Liberty. Auburn, Alabama, U.S.: Ludwig von Mises Institute, 2010, p. 19. ^ a b Huerta de Soto 2010, p. 80. ^ a b c d Viereck (2006), p. 74. ^ Huerta de Soto 2010, pp. 79–80. ^ Huerta de Soto 2010, p. 79. ^ Viereck (2006), pp. 74–75. ^ a b Viereck (2006), p. 75. ^ a b c Marshall S. Shatz. Jan Waclaw Machajski: A Radical Critic of the Russian Intelligentsia and Socialism. Pittsburgh, Pennsylvania, US: University of Pittsburgh Press, 1989, p. 86. Dorey, Peter (1995). The Conservative Party and the Trade Unions. Psychology Press. ISBN 0-415-06487-2. Heywood, Andrew (2013). Politics. Palgrave Macmillan. ISBN 1-137-27244-9. Huerta de Soto, Jesús (2010). Socialism, Economic Calculation and Entrepreneurship Fourth edition. Edward Elgar Publishing. ISBN 1-849-80500-8. Vincent, Andrew (2009). Modern Political Ideologies. John Wiley & Sons. ISBN 1-444-31105-0.